My last post focused on impressions of a trio of mobile games: Dandy Dungeon, Forget-Me-Not and Heart Star. I enjoyed all three and solidly recommended each of them as result. The 3DS titles discussed in this write-up are not so cheap. Go! Go! Kokopolo 3D will set you back just shy of six bucks (or a smidgen over after you factor in taxes), while Kirby: Planet Robobot and Poochy & Yoshi's Woolly World will cost you five to seven times that amount (about $30 to $40), depending on where you pick up a copy. Are they worth those amounts? 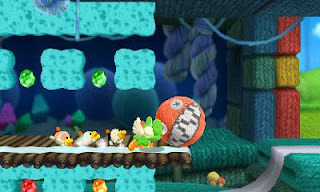 Poochy & Yoshi's Woolly World is more than worth its asking price, assuming you tend to like platformers. I'd say the same about Kirby: Planet Robobot if the asking price in question is closer to $30 than $40 and if you're OK with straightforward games that are more about letting go and having fun than they are about uncovering secrets or strategically taking out tough-as-nails foes. As for Go! Go! Kokopolo 3D, I think I'll make you read the next couple of paragraphs to find out whether I consider its price tag to be just right or a tad too high. And while you're at it, read the paragraphs that follow, too. They'll help explain why I'm so gung ho about Poochy & Yoshi's Woolly World and not quite as gung ho about the latest Kirby title. Go! Go! Kokopolo 3D--Although the original Go! Go! Kokopolo fascinated me when it was released back in 2011, I didn't own a DSi at the time and so had to pass on it. I finally bought it a month or so ago when it dawned on me that it was still available on the Japanese 3DS eShop, though, and after giving this curious "chase 'em up" a thorough once-over I sternly berated myself for ignoring it for so long. The good news for those of you who are unable to access the first Go! Go! Kokopolo (it was pulled from the European and North American 3DS eShops some time ago for reasons I can't recall): this follow-up is nearly identical to its precursor in terms of looks, sounds and gameplay. Yes, Go! Go! Kokopolo 3D features a ton of new level designs and a pair of additional playable characters, but in general it's almost indistinguishable from Tanukii Studios' first effort. Which is great--for the most part. I say that because while I adore its aesthetic (seriously, the sprites and backdrops showcased in Go! Go! Kokopolo 3D are of the highest order) and enjoy its classic, Pac-Man-inspired gameplay, I also think it has a tendency to be complicated, confusing--due in large part to its overly long, winding and asymmetrical stages as well as its too-tight camera--and frantic. In the end, I wish a Go! Go! Kokopolo 3D demo existed so folks could see if it's their cup of tea before handing over hard-earned cash to acquire it. Since that's not the case, my suggestion would be to watch a few videos of the game in action. If what you see seems appealing, you probably won't regret your purchase. As for me, I'm happy Go! Go! Kokopolo 3D exists and I'm glad it's currently taking up space on my 3DS' home screen, but I'm not sure how much more time I'm going to put into it. I honestly find it a fraction too frenetic at the moment, so for now it's moving to my system's back burner, as the saying goes. I'll do my best to let you know if that changes and this digital title returns to my good graces. 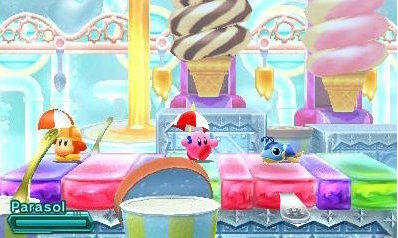 Kirby: Planet Robobot--I wish I could tell you why I passed on Kirby: Triple Deluxe even though it excited me when it was first announced. I guess I just wasn't in the mood for another Kirby game at the time. Hell, I turned my nose up at Planet Robobot well past its release date, too. I only picked up a copy a couple of weeks back because I had some "free" money burning a hole in my pocket and I'd read so many positive assessments of the game that I figured I should break down and give it a go. Now that I've done just that--and then some (I dropped nine hours into Planet Robobot during my week-long playthrough)--what are my impressions of the experience? For starters, I've got to say it's an audio-visual delight. Many of the stages on offer here (the one featuring giant ice cream cones that fall forward and attempt to impede your progress is a prime example) will make you grin from ear to ear, as will the buoyant tunes that accompany them. Beyond those admittedly superficial details, this 3DS entry follows in the footsteps of every other worthwhile Kirby title in that it proves to be a blast to play. That's true when it comes to testing out the new copy abilities--I especially got a kick out of the "doctor" and "ESP" ones--and it's even more true when it comes to rampaging through entire sections of a particular stage using the titular Robobot Armor. The lone complaint I'm willing to level at Planet Robobot: sometimes I wished it were a little less straightforward. So much care was put into ensuring this game was as colorful and charming as can be that it's a real shame you're rarely encouraged or even allowed to slow down and appreciate your surroundings. Still, if you're in the mood for a breezy platformer that won't tax you too much, you could do far worse than purchase Kirby: Planet Robobot. Poochy & Yoshi's Woolly World--It's been a long time since I've fallen in love with a Yoshi game. Although I liked Yoshi's New Island well enough, it pales in comparison to the 16-bit original. The same could be said of Yoshi's Story for the Nintendo 64. Well, Poochy & Yoshi's Woolly World is miles better than both of those titles, in my opinion. Not only that, but it's nearly on par with the game that started it all. In a few respects, I'd go so far to say it surpasses that effort. One example: its gameplay. This 3DS title is a bit slower than Island, but it makes up for that possible shortcoming with (seemingly) longer levels that beg to be explored. It also tosses tons of unique and interesting challenges at players. One of my favorites pops up in a stage that forces you to use disappearing Bullet Bill contrails as platforms, although it's just the tip of the iceberg as far as such things are concerned within Woolly World. For me, Poochy & Yoshi's Woolly World is the clear winner among the trio of 3DS games discussed here. It's easily the most expensive of the bunch, but in my experience it also provides the most enjoyment. To those of you who've played any or all of these portable titles: what do you think of them? Please share your impressions and opinions in the comments section of this post. Now that I've finally put the Dragon Quest VII 3DS remake to bed, I have tons of time and energy to play other games--a fact that should be obvious by the number of titles discussed in this post as well as my next one. I know what some of you are thinking: no Vita games? Nope, sorry. I keep meaning to boot up that system and play some Dragon Quest Builders or Mystery Chronicle: One Way Heroics or Yomawari, but I'm so wrapped up in the iOS games mentioned here (and the 3DS games that'll be highlighted in the write-up I'll publish in just a couple of days) that those plans inevitably fall by the wayside. Who knows, though? Maybe I'll turn my attention to the Vita once I'm done with these titles. In the meantime, I hope you enjoy the impressions that follow. 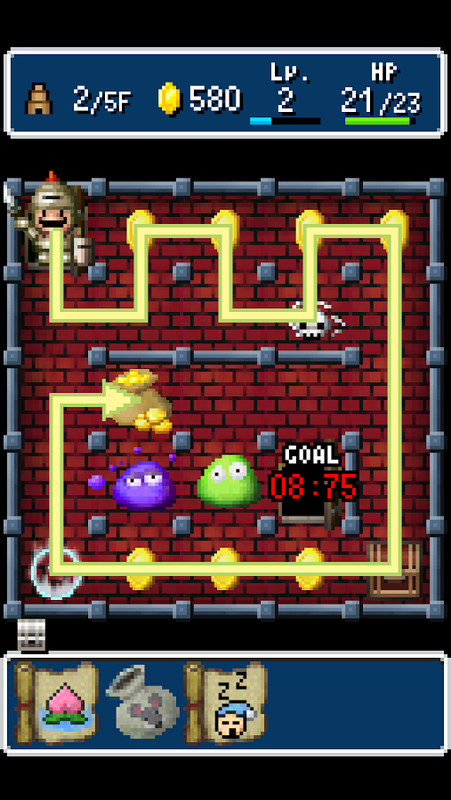 Dandy Dungeon--I first downloaded this free-to-play mobile game because I heard Yoshiro Kimura had a hand in it. That was a big deal to me, as his past credits include Chulip, Little King's Story and Moon: Remix RPG Adventure. I also was pleased to discover Kazuyuki Kurashima acted as this title's art director, as he previously crafted the character designs for games like Freshly-Pickled Tingle's Rosy Rupeeland and UFO: A Day in the Life. As you might imagine given its pedigree, Dandy Dungeon shares the bizarre quirkiness that's front and center in basically all of the aforementioned games. It plays nothing like them, though. Instead, Dandy Dungeon is one part roguelike and one part puzzler. Dandy Dungeon is a lot more engaging and interesting than that description likely makes it sound, so don't be shy about downloading it if you have a device that's capable of running it. Forget-Me-Not--What timing! Just a week after I published a post about my five favorite Pac-Man clones, my friend Jess introduced me to another one. Will I be updating the write-up I just mentioned to include this 2011 release? Perhaps in the future, but not right now. Still, I'd be lying if I implied Forget-Me-Not failed to impress me during the handful of minutes I devoted to it over the last few days. The thing I like about it most so far is that it turns the Pac-Man formula on its head just enough to feel fresh. For starters, Forget-Me-Not's maze-like stages are decidedly asymmetrical. Also, its Qbby-esque protagonist (if it can even be called that) automatically shoots lasers or bullets or some other sort of projectile in whichever direction it happens to be facing. 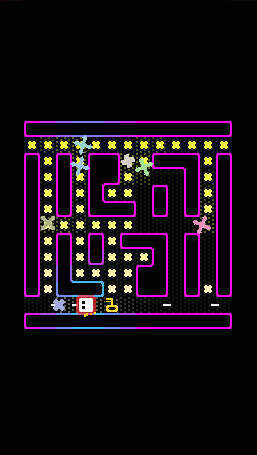 Oh, and to move from one level to the next, you first have to collect all of the current board's "flowers" (this game's version of the pac-dots that fill Namco's arcade classic) and then you have to unlock the door that appears in their wake using a key. Beyond that, Forget-Me-Not sports an appealing aesthetic that makes it look like a minimalist Pac-Man Championship Edition. 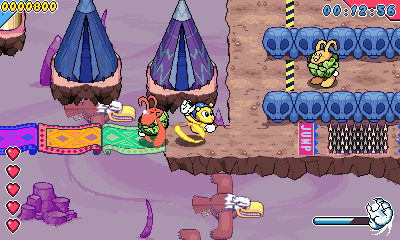 Also, destroying any of the enemy creatures that slither about each stage produces a plethora of yummy-looking food items that can be picked up for bonus points--and anyone who knows me knows I love games with nabbable noshies. Unfortunately, this Nyarlu Labs creation lacks the kind of thumping soundtrack most would expect from such a game, but the bleeps and bloops that accompany the action on hand still do a good job of setting the right mood, so don't let that keep you from giving Forget-Me-Not a try. Heart Star--I became aware of this mobile game while casually perusing Twitter a few days ago. A chap named Peter Willington praised its retro aesthetic and called it a "top puzzle platformer" while passing along a smattering of screenshots. That's all I needed to jump in with both feet. And guess what? Peter was right to applaud this Jussi Simpanen-made title. First, it looks like something Taito would've released back in its heyday (think Bubble Bobble and Rainbow Islands--or, better yet, Parasol Stars). Second, its gameplay hook is brilliantly unique. Anyway, it's a lot of fun, it's free--as long as you don't mind an ad popping up every few levels (and if you do mind it, forking over $1.99 will remove them)--and it's highly recommended by moi. Have you played any mobile games that really left an impression on you? If so, let me and others know about them in this post's comments section. I've put a lot of time into Poochy & Yoshi's Woolly World this past week. Nearly 15 hours, to be exact. In fact, I'm not too far from the finish line--if you consider the finish line to be completing every level. Although I've nabbed all the flowers, stamp patches and yarn bundles hidden within the game's first three worlds, I'm not sure I'll even attempt to do the same in its last three. If I do, expect it to add another 10 or 15 hours to my play time. That wouldn't be the worst thing in the world, of course. After all, it would allow me to fully take in the game's wonderful soundtrack. "Duplicitous Delve" is the first Poochy & Yoshi's Woolly World song that really jumped out at me. I especially like its chill vibe. "Yoshi and Cookies," above, takes me back to the original Yoshi's Island. I mean, it's no "Athletic," but it's still pretty snazzy, wouldn't you agree? The bouncy, jazzy feel of "Ms. Cluck the Insincere" made the corresponding boss battle (at the end of the game's third world) one to remember.